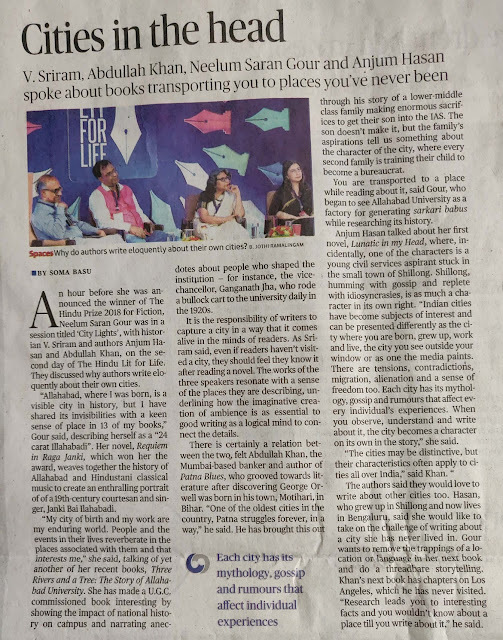 An hour before she was announced the winner of The Hindu Prize 2018 for Fiction, Neelum Saran Gour was in a session titled ‘City Lights’, with historian V. Sriram and authors Anjum Hasan and Abdullah Khan, on the second day of The Hindu Lit for Life. They discussed why authors write eloquently about their own cities. “Allahabad, where I was born, is a visible city in history, but I have shared its invisibilities with a keen sense of place in 13 of my books,” Gour said, describing herself as a “24 carat Illahabadi”. Her novel, Requiem in Raga Janki, which won her the award, weaves together the history of Allahabad and Hindustani classical music to create an enthralling portrait of of a 19th-century courtesan and singer, Janki Bai Ilahabadi. “My city of birth and my work are my enduring world. People and the events in their lives reverberate in the places associated with them and that interests me,” she said, talking of yet another of her recent books, Three Rivers and a Tree: The Story of Allahabad University. She has made a U.G.C. commissioned book interesting by showing the impact of national history on campus and narrating anecdotes about people who shaped the institution — for instance, the vice-chancellor, Ganganath Jha, who rode a bullock cart to the university daily in the 1920s. It is the responsibility of writers to capture a city in a way that it comes alive in the minds of readers. 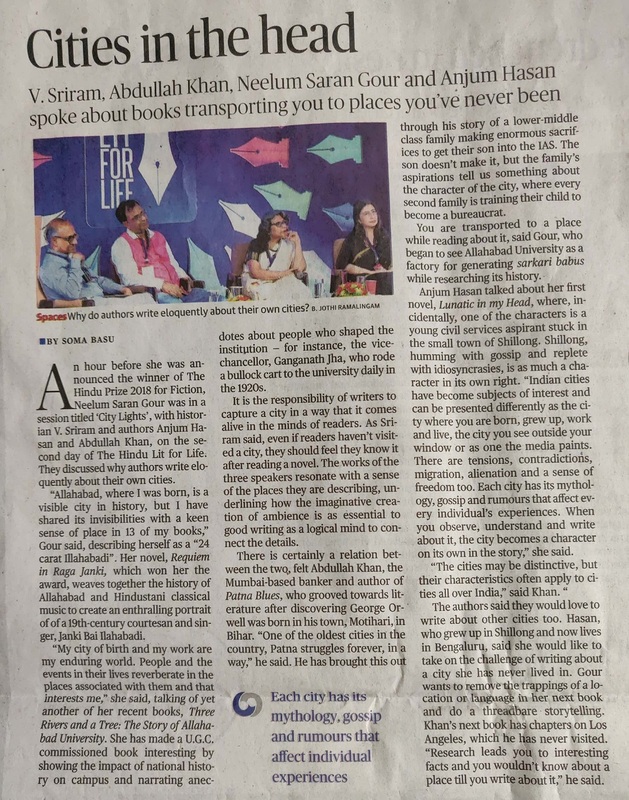 As Sriram said, even if readers haven’t visited a city, they should feel they know it after reading a novel. The works of the three speakers resonate with a sense of the places they are describing, underlining how the imaginative creation of ambience is as essential to good writing as a logical mind to connect the details. 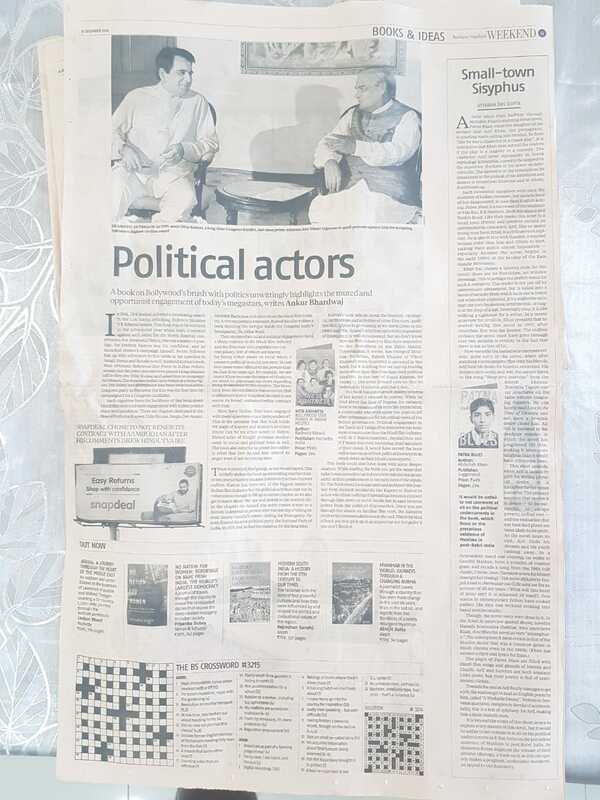 There is certainly a relation between the two, felt Abdullah Khan, the Mumbai-based banker and author of Patna Blues, who grooved towards literature after discovering George Orwell was born in his town, Motihari, in Bihar. “One of the oldest cities in the country, Patna struggles forever, in a way,” he said. He has brought this out through his story of a lower-middle class family making enormous sacrifices to get their son into the IAS. The son doesn’t make it, but the family’s aspirations tell us something about the character of the city, where every second family is training their child to become a bureaucrat. You are transported to a place while reading about it, said Gour, who began to see Allahabad University as a factory for generating sarkari babus while researching its history. Anjum Hasan talked about her first novel, Lunatic in my Head, where, incidentally, one of the characters is a young civil services aspirant stuck in the small town of Shillong. Shillong, humming with gossip and replete with idiosyncrasies, is as much a character in its own right. “Indian cities have become subjects of interest and can be presented differently as the city where you are born, grew up, work and live, the city you see outside your window or as one the media paints. There are tensions, contradictions, migration, alienation and a sense of freedom too. Each city has its mythology, gossip and rumours that affect every individual’s experiences. When you observe, understand and write about it, the city becomes a character on its own in the story,” she said. The authors said they would love to write about other cities too. Hasan, who grew up in Shillong and now lives in Bengaluru, said she would like to take on the challenge of writing about a city she has never lived in. Gour wants to remove the trappings of a location or language in her next book and do a threadbare storytelling. Khan’s next book has chapters on Los Angeles, which he has never visited. “Research leads you to interesting facts and you wouldn’t know about a place till you write about it,” he said. Three novelists got together to converse with The Hindu’s ideas editor, Mini Kapoor, about the story-teller’s craft, in a session titled ‘Tellers of Tales’ held on the second day of The Hindu Lit for Life. The first question that came up concerned why they chose to take up novel-writing. 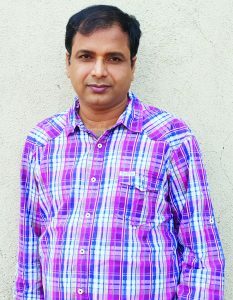 Abdullah Khan, screenwriter and banker, whose debut novel Patna Blues was released in late 2018, said that when he was seven, his father gave him a story book: he told his father that some day, he too would write a book. But, Khan said laughing, it was only the day when Arundhati Roy won the Booker that he actually started writing. It took 20 more years for his book to appear in print. 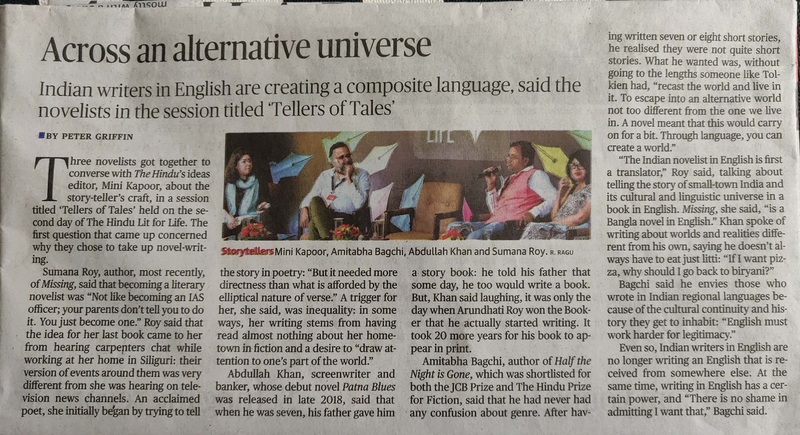 Even so, Indian writers in English are no longer writing an English that is received from somewhere else. At the same time, writing in English has a certain power, and “There is no shame in admitting I want that,” Bagchi said. IN HIS DEBUT novel, Patna Blues, Abdullah Khan traces the cycle of a civil service aspirant, whose life slides in a whirlwind of crisis. The book also gives a glimpse of what impact early nineties events had on the lives of people living in the small towns of the country. In an interview with BEDASREE DAS, Khan talks about how inspiration behind the central character, his love for poetry how the Bihari hinterland has inspired his work. When did the idea of writing ‘Patna Blues’ first occur to you? I was born in a village called Pandari near Motihari. In the early 1990s, I discovered George Orwell was also born in Motihari. And, this Orwell’s connection with my home district drew me towards literature. The idea to write a novel began to take shape when I was still in college. But, actually, I started writing ‘Patna Blues’ in 1997 just after Arundhati Roy won the Booker Prize. Initially, it was a romantic drama mostly focussing on Arif’s love life. Now, in its present avatar, Patna Blues is a culturally insightful coming-of-age novel with political undertones and is set in the Bihari hinterland. Debut novels sometimes tend to be semi-autobiographical. Which aspects of your life did you touch upon in Patna Blues? Patna Blues is a work of fiction and Arif is a fictional character. Unlike Arif, I was never interested in the civil services. But, yes, the moral values of Arif are quite similar to those of mine. And, like Arif, I also lived in police colonies in Patna and Darbhanga. Some of the characters like Arif’s mother, father and grandmother are inspired by my own mother, father and grandmother. Precisely speaking, it is 80 per cent fiction and 20 per cent autobiographical. Is the book to be seen as a product of pure imagination or an attempt to highlight certain factors influencing the society at large? Albert Camus said, “Fiction is the lie through which we tell the truth.” So, the characters and situations in Patna Blues are imaginary but they, of course, reflect the realities of our times. In other words, I have tried to tell a good story which has some messages hidden in it. And, if I am able to make even a small positive change in our society through my stories then I’d consider myself lucky. Joining the civil services is seen as a prestige symbol for many families in Bihar. Do you think a lot of youth give up their passions and succumb to family pressure? Yes, it is true that civil services is a general aspiration of the middle-class Biharis. And many young men and women ruin their lives while pursuing this goal. You share your deep interest for Urdu poetry with the central character Arif. How important was the poetic bent to Arif’s story? Or was it just an added element to his character? The common interest between two major characters, Arif and Sumitra, is Urdu poetry, so it is obvious that they will use poetry in their conversations. Additionally, the use of poetry in my novel is not only for ornamental purposes but they have also been used as a narrative tool. In this novel, I have mostly used my own poems, for both Arif and Sumitra. I believe that this novel couldn’t have been written without using Urdu poetry. What kind of influence does Orwell have in your works? As I already told you that Orwell’s connection with my hometown was the main inspiration for me to become a writer. But, despite being an admirer of George Orwell’s writings, my works are not influenced by him. Which writers/poets have influenced your work as well your perspective in life? There are some artists who have inspired me throughout my life. Phaniswer Nath Renu, Prem Chand, Saadat Hasan Manto, Habib Jalib, Mirza Ghalib, Rohinton Mistry and Chimamanda Ngozi Adichie are just some of them. Are there more projects in the pipeline? If so, please tell us about them in brief? Right now, I am working on a novel titled Aslam, Orwell and a Pornstar. It is about a man called Aslam who was born in the same house in Motihari, India, where George Orwell was born. The story is set in Motihari, India, and Los Angeles, USA, against the backdrop of contemporary political events. There are plans to write sequels to Patna Blues. Simultaneously, I am also working on a fiction project for a TV channel. Previous articleConfirmed railway tickets can now be transferred! The novel is also a portrait of Patna. Abdullah Khan’s debut novel is about a Muslim family struggling to make ends meet, and about the burden of religious identity. The book offers a vivid portrait of 1990s Patna, writes Isha Aggarwal. It is not often that one comes across a coming-of-age portrait of a boy belonging to the lower middle-class Muslim family in the provincial landscape of Patna. Abdullah Khan’s debut novel charts the trajectory of one such boy, Arif Khan—an IAS aspirant, a poet, a dreamer, a lover. However, the narrative goes much beyond that. Through the eyes of Arif Khan, the author brings to life the predicament of the Muslim community in the Bihari hinterland. Set in the momentous decade of the Nineties, the book encompasses events like the demolition of Babri Masjid, Bombay riots, Gujarat riots etc.—events that marred the psyche of the Muslim community and deepened the fractured lines across the nation. Patna Blues is the story of the hopes and aspirations of an IAS aspirant, and also of his failures and disappointments. In anticipation of rising up the social ladder and to bring an end to his familial and financial troubles, Arif Khan spends his 20s preparing for the prestigious Civil Services Examination like many of his peers. Further complicating his life, Arif becomes enamoured with an older, married woman, Sumitra, belonging to another religion, thus bringing into the equation a Hindu-Muslim issue. Lonesome and bored, Sumitra encourages Arif’s advances, which also becomes the cause for his undoing, to an extent. Devoured by his desire, Arif loses his focus. However, his love for Sumitra doesn’t stop Arif from passing a judgment upon Abida Begum, who defies societal conventions by committing adultery with a Hindu man. “What kind of a shameless woman is this? Arif thought. He did not like the idea of humiliating a woman publicly but he also didn’t like the way Abida defied the Emarat Committee. At least she should show some remorse for what she has done.” Ultimately, a product of his society, Arif stops short of challenging the regressive mores of society. It is Arif who persuades his father not to flout societal rules and to pay the dowry for his sister’s marriage as the breaking of the engagement would make it difficult to find another suitor for her. Parallel to the story of Arif is the story of Arif’s brother, Zakir. An upcoming actor, Zakir leaves for Mumbai only to find exploitation and disappointment in the city of dreams. Ending up at the bottom of the hierarchy—an extra—Zakir ultimately returns home with shattered dreams. The heartbreak suffered by Arif and Zakir is aggravated by the diminishing status of Arif’s father in the police force, who pays for being an honest officer in an otherwise corrupt department and is posted to a Naxal-infested area. As Arif’s father resigns from the service, the family is reduced to penury. Sadness looms large over the narrative. Written in a simple and lucid style, Patna Blues is an engaging tale of the lives of a conventional Muslim family struggling to make ends meet while dealing with the larger issue of identity. The otherwise smooth narrative is, at times, marred with random incidents just to bring home the distrust between the Hindus and Muslims. In one such episode, Arif’s father comes home livid as another officer from the National Intelligence Department has refused to hand over the file to him since he is a Muslim. The file contains information about the ISI’s activities in Bihar. The incident ends as arbitrarily as it begins and serves no purpose in the overall narrative. The trials and tribulations of Arif end on the note of hope. The ending seems to be a bit erratic, leaving the reader with several unanswered questions. Peppered with Urdu couplets, the novel is not just a portrait of Arif’s life, but also of Patna. With vivid descriptions of local legends like river ghosts and infamous places, Patna Blues gives readers glimpses into a city that few have known this closely. A little more than halfway through Abdullah Khan’s stunning debut novel, Patna Blues, when the daughter of the woman that Arif Khan, the protagonist, is courting starts calling him brother, he feels “like he was a character in a Greek play”. It is instructive that Khan does not tell the readers if the play is a tragedy or a comedy. TO READ FULL REVIEW CLICK HERE. BEHIND PAYWALL . At first glance, Abdullah Khan’s debut novel Patna Blues seems to be the story of a young man who falls in love with an older woman; the relationship being further complicated because they belong to different religions. But soon, it becomes obvious that the love story is just one of the many narrative strands in the novel. Set in the 1990s, when the country saw many political and social changes, the trajectory of doomed attraction between the couple seems to echo the upheavals in society. The fury of religious riots and the changing rules of educational opportunities that threaten to derail the lives of youth form the backdrop in this novel. The depiction of the easy ways in which the collective anger of people can be stoked to dangerous levels offers sobering insights into how religious fault lines can make neighbours turn on each other without hesitation or mercy. The author points out how stray rumours can be used to fire up passions and create disturbances in society — a tactic that has been employed around the world by forces intent on letting differences fuel their insatiable hunger for power. Abdullah Khan, a Mumbai-based screenwriter, lyricist and novelist, was born in a poor Muslim village near Motihari, Bihar. He was educated in an Islamic seminary and Urdu-medium schools. Though the story is fictional, many events and characters have been modelled on real-life incidents and people that the author has come across. He takes us from the city of Patna to the rural areas of Bihar in a seamless narrative rich with descriptions. When circumstances keep arranging a meeting between the protagonist Arif Khan, a young man preparing for his IAS exams, and Sumitra, the wife of a bank manager, the two try to fight off their mutual attraction. Khan has to think not only about his responsibility to his family as the firstborn, but also the strict moral codes instilled in him by his god-fearing mother and grandmother. He tries to concentrate on his studies and move past his attraction by physically removing himself from Patna and focusing on trying to clear the UPSC examinations. Every year, when the results are announced in the newspapers, there is always a reference to successful candidates from Bihar or a coaching institute from the region boasting a tally of students topping the fiercely competitive examination. This single-minded purpose of joining the civil services among the youth comes across in the determined efforts of Khan and his friend who mark their days to the portions of studies they have to complete. Khan studies diligently and comes close to cracking the exam. But he fails at the interview stage, and has to start all over again. When this happens repeatedly, he begins to wonder if his name has something to do with his failure. But he manages to go back to his books with hope and determination. This thread of hope is a recurring motif in the novel, allowing reprieve from the many disturbing events unfolding around Khan, who belongs to a lower middle-class family. However, even when the characters live out their lives on hope, the heavy hand of disappointment marches alongside, striking repeatedly. Khan’s family — brother Zakir, three sisters, parents and grandmother — all have to fight their battles in a world where chance leans in favour of the privileged. Zakir enjoys a run of success as a theatre actor in Patna but when he tries to take his talent to the big screen, he finds it difficult to make a mark. For Rabiya, Khan’s eldest sister, whose marriage has been fixed and preparations have begun, the last-minute demand for a large dowry leads the family to take a tough decision. When it is time for the marriage of the next sister in line, Khan’s family has to decide whether to get her married to a much older man. Framing the story are intriguing descriptions of life in the interior regions of Bihar where travelling in the bullock cart was a norm even in the last decade of the 20th-century. Tales about river ghosts and Robin Hood-style dacoits who come to Khan’s rescue while he was fleeing from armed bandits offer fascinating glimpses of life in a place not in immediate view. Livening up the narrative further are poems and couplets in Urdu that act as the bridge between the blossoming love between Khan and the older Sumitra. As the novel comes to an end, we find Khan on the brink of new beginnings, personally and professionally, even though they are not what he had envisaged for himself. As he quietly accepts the choices sent his way by fate, he soon becomes aware of some tough decisions he would have to take in the near future. The author has left some questions unanswered, and the reader can only guess and hope that the answers will come in a sequel or two. Patna Blues is an unputdownable saga of life from one of the less explored parts of India.